So another day, some sunshine, some dogs met and some serious napping. 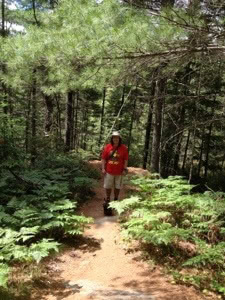 In the middle of it all, we went for a drive ( back into JALE for me) and then walked along this trail of wood. You can see from out family portrait how much goofy fun we were having! 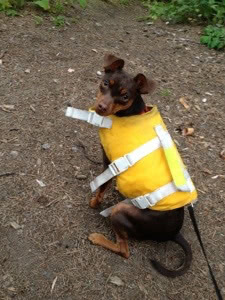 Apparently this “hand me down” life jacket from Boing did not need any adjusting at all. And we headed off into the crazy floating bowl. There will be pics of me splashing about in the cool water, having fun etc. but we did not get photos of me getting a bath. Too many hands needed for the procedure! Mom brought the @pawsonearth über envirofriendly bar of soap I won a few months ago and … No more wet dog smell! Curled up in my warm blanket in JALE while mom and dad played cards. Thank goodness for my Laurablanket for sleeping ! 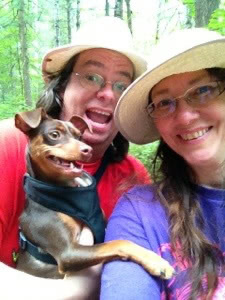 This entry was posted in Life in General and tagged minpin, Puppy camping by Sprocket. Bookmark the permalink.